This is the first group in October of 1944 that became Paratroopers in England for the 101st Airborne Division at Chilton Foliat Jump School. The men coming in were all attached to Service Company 502nd Parachute Infantry. In the States it took 4 weeks to become receive your Jump Wings. In England it was much quicker at just over 8 days. This group started training 6 October 1944 and graduated 13 October 1944. 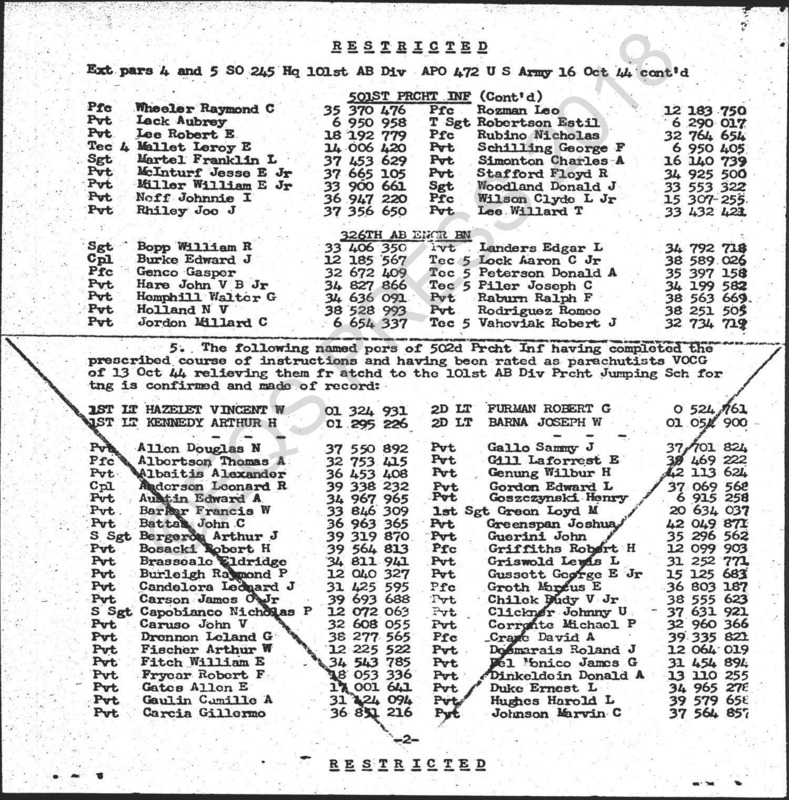 The first Morning Report 9 October 1944 shows the men starting Jump School with men from the 501st, 502nd, 506th and 326th Airborne Engineer Battalion. The second Morning Report 18 October 1944 shows the men who became Paratroopers. The last two Morning Reports from 12 October and 16 October 1944 show the men who washed out of training. 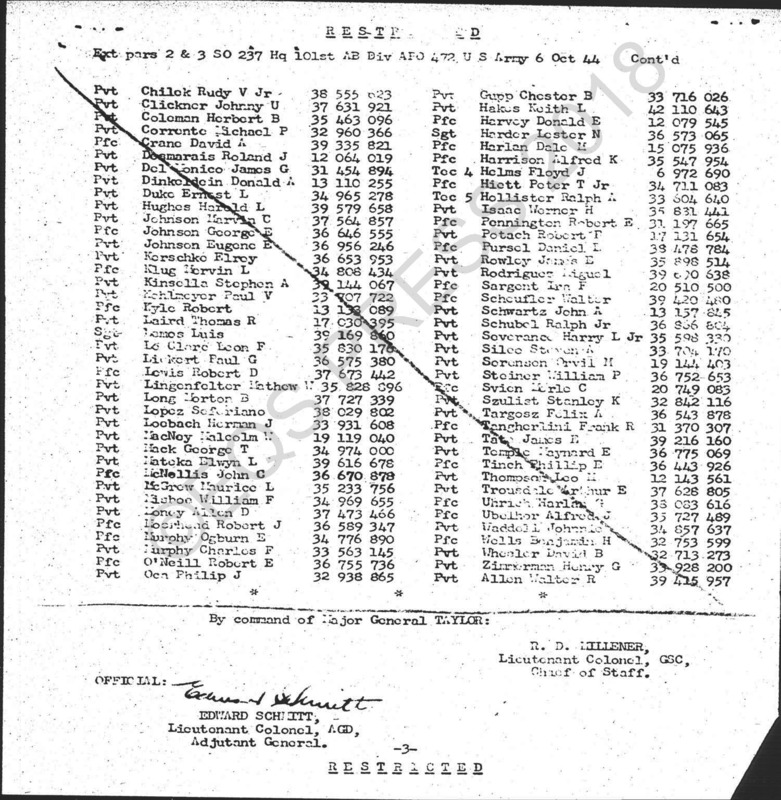 The 12 October 1944 Morning Report shows 2nd Lt Child relived from attachment to Service Company. 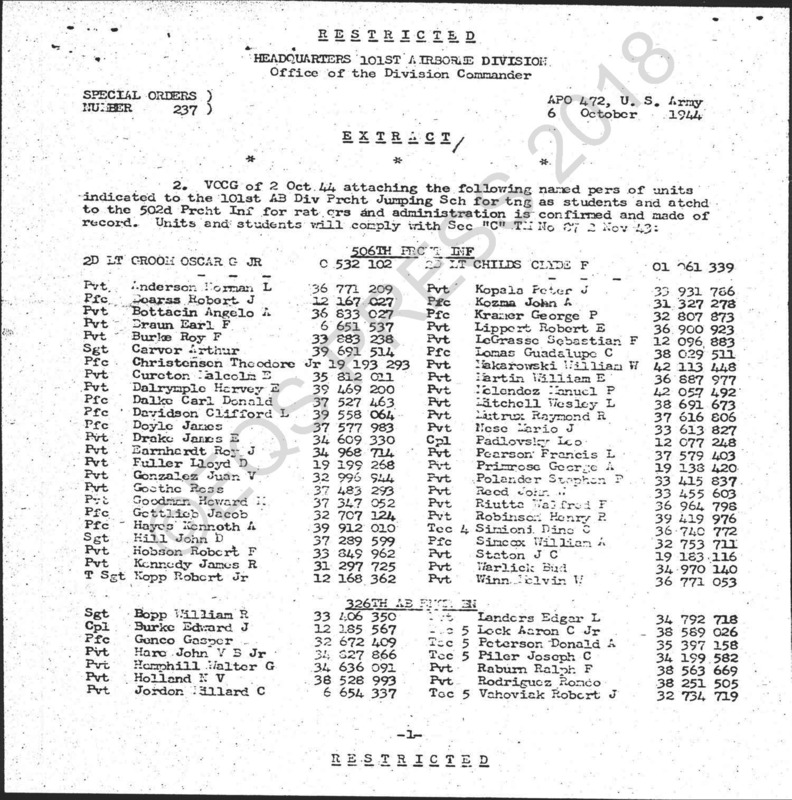 The 16 October 1944 Morning Report shows men from various units being relieved from attachment from Service Company. 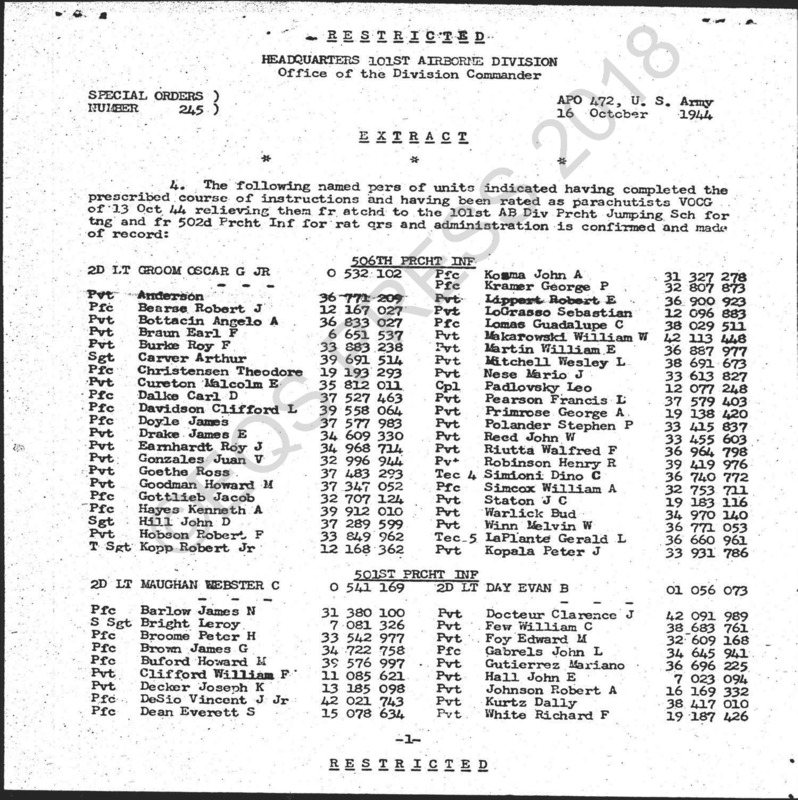 Those men are not listed on the 18 October 1944 Morning Reports. This is the second group in October of 1944 that became Paratroopers in England for the 101st Airborne Division at Chilton Foliat Jump School. The men coming in were all attached to Service Company 502nd Parachute Infantry. The first Morning Report 1 October 1944 shows the men coming into Jump School with men from the 501st, 502nd, 506th Parachute Infantry Regiments. But this group didn’t actually come in to Service Company until 10 October 1944 as stated on the 12 October 1944 Morning Report. Jump Training started 11 October 1944 as this group also now had the 326th Airborne Engineer Battalion soldiers and one 326th Airborne Medical Company soldier and 54 soldiers from the 12th Replacement Depot on 7 October 1944. 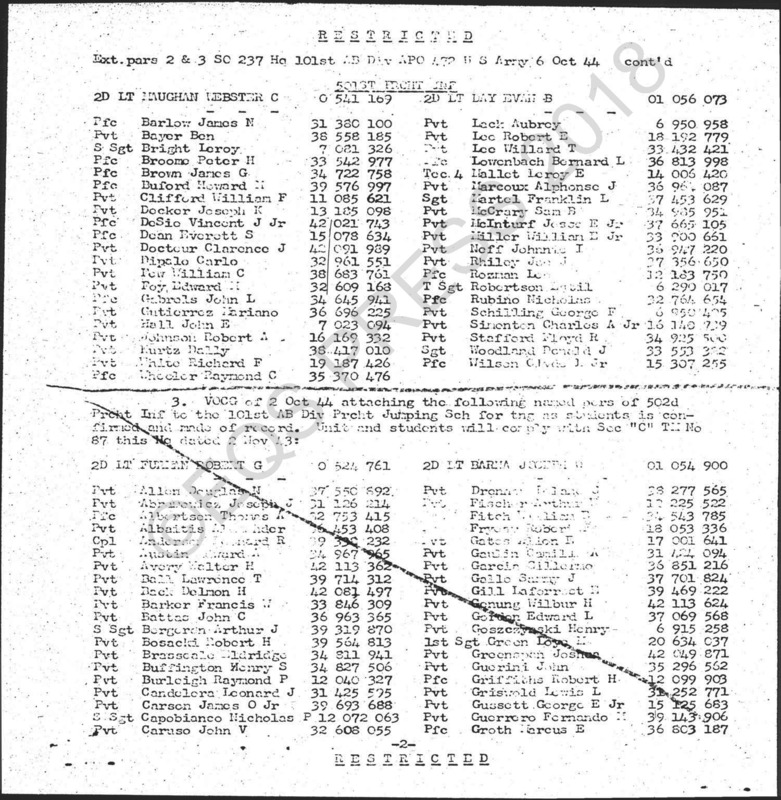 The Morning Report 24 October 1944 shows the soldiers who became Paratroopers as of 23 October 1944. Once again there were men who washed out. 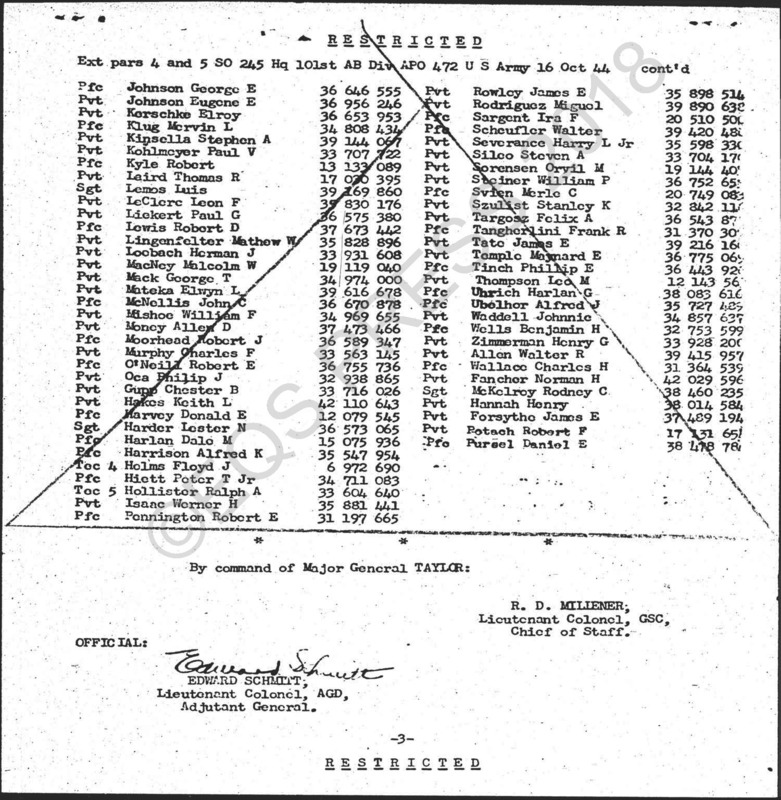 You can see there are men from the 12 October 1944 soldiers who are not on the 24 October 1944 Morning Reports. The soldiers from the 12th Replacement Depot who became Paratroopers went into the 502nd Parachute Infantry. The men in the October groups became replacements for what became the Battle of the Bulge in December 1944.